Once you wear a fake synthetic blue sapphire stone, a series of calamities will follow you including bad health, accidents, wealth loss, etc. The best way to test the truth of the stone is that while holding a real Neelam you will feel warmth spreading in your hand. Wearing a legit Neelam stone can work in your favour, making even a pauper into a king while a fake stone can bring you down from the status of a king to that of a pauper. Hence, buy the stone only from trusted stores and not from any local roadside vendor. 2. Check out the flaws! According to astrology as well as many sacred texts, a Neelam stone can have 16 kinds of major flaws which can result in immense misfortune, destruction and sorrow. So, being on a safer hand get your stone evaluated by an experienced astrologer or gemologist. For example, there is a flaw named Dudhiva and if this flaw is present in your gem stone, several spirals will start forming giving the stone a milky look. Make sure that you get any kind of flaws detected if you want to prevent yourself from any additional burdens. 3. Perform the suitability test! 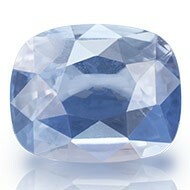 One of the easiest and best way to test the suitability of Blue Sapphire stone is by getting the gem stone sewed in a white cloth such that it is twisted like a band. All you have to do is to tie this around your arm or bicep in a way that a small portion of the stone is exposed and touches your skin. Make sure that you tie this band on your arm while facing east direction. Wear this for a period of 3 days and be alert for any kind of changes. If you are not comfortable with the gem stone directly touching your skin, we also have an alternative option for you. What you can do is, take a pure Neelam stone and place it under your pillow. You can even keep the gem stone in your shirt’s left pocket. Wherever you place it, keep the stone there for three days duration. Again, be on the look out for any kind of small or big changes and discuss it with your astrologer. 5. Which change means what? If nothing much happens with you within the 3 days duration, you remain healthy and you dream of intimate physical relationships or positive things, then that means that the Blue Sapphire stone has got adjusted with your astrological conditions as well as your body. In case the stone suits you, any kind of good news might be coming to you soon. Although, if in the duration of three days, you suffer from any kind of medical ailment or dream about violence, destruction or scary events, then this shows that the stone is not working in your favour. It is recommended that in such circumstances, you get rid of the stone as soon as possible. We hope that you are able to successfully test the suitability of the Neelam stone!